Senti, the home of all things fragrant are delighted to announce that Dr. Vranjes luxury fragrances are now adorning the rooms of the four star Bedford Lodge Hotel in Newmarket, Suffolk. Bedford Lodge Hotel Chief Executive, Noel Byrne was introduced to the Dr. Vranjes Collection by Jeff Ward of Cannizaro House earlier this year. Cannizaro House have been using Dr. Vranjes fragrances in their Wimbledon hotel for over a year now. The Dr. Vranjes fragrances are stunningly presented in beautiful and original glass bottles inspired by, and carefully created to follow, the lines of the famous “Duomo”, Florence’s Cathedral of Santa Maria di Fiori - the City’s symbol of pride. The Bedford Lodge Hotel is currently displaying the Aria fragrance in their reception area and has a statement-making 2.5 litre sized bottle greeting visitors. A light fresh fragrance of citrus, lemon and orange blossom, lemon essence and the fresh, green scents of white musk and wild mint, together with bergamot and blooming mimosa all blended with Marine Algae. 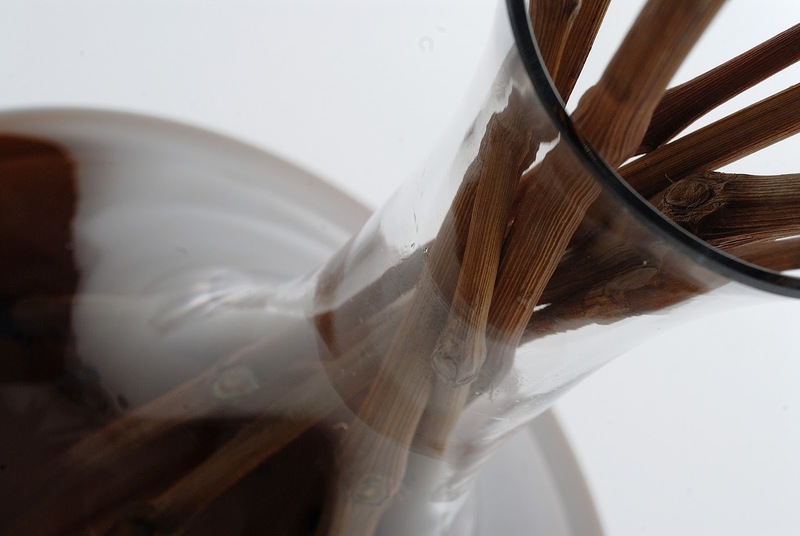 On entering The Roxana Bar, you will be greeted by the scent of fine dessert wine, blended with essentials, herbs and spices. Uniquely, Grape Vines are used to defuse this fragrance in a reusable decanter. 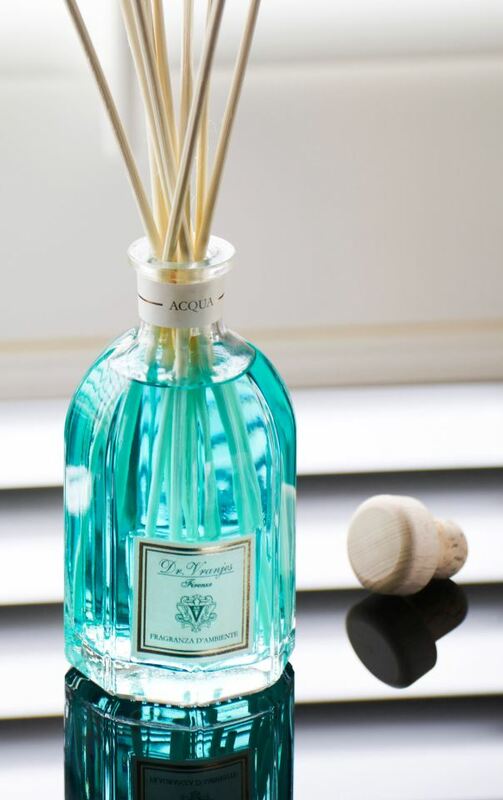 In the bathrooms of the suites and junior suites at Bedford Lodge, you will be greeted by the wonderful scent of Dr. Vranjes Acqua, a personal favourite of Noel. A refined and light marine fragrance, with notes of basil blended with white musk & marine algae. Whilst in the lounge area’s of the suites you will find the delicate, yet energetic Ginger & Lime and the warm and elegant Melograno (Pomegranate). 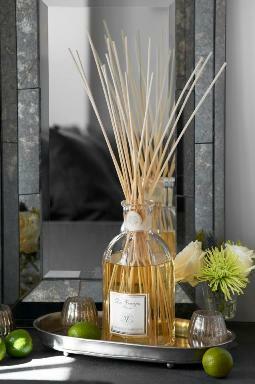 Melograno is a very memorable and instantly recognisable fragrance used in many of the finest hotels. Fruity, woody notes of black grape and watermelon recreate the intense juicy fragrance of crushed pomegranate seeds. Bedford Lodge is also trying out a new fragranced, turn down service. As part of the service guests rooms are sprayed with Dr. Vranjes room sprays. As well as the Melograno, Bedford Lodge is enhancing their customer experience by using the citrus fragranced Aria, and the fresh, sunny fragrance of Green Flowers. Green Flowers has top notes that include lemon and bitter orange blossom, natural green tea, flowers of ylang ylang, jasmine, mimosa and narcissus. Senti became the sole UK distributor of the luxury brand of Dr. Vranjes room fragrances following Debbie Knight’s stay at the Villa Vedetta in Florence, which uses the fragrances throughout hotel. The fragrances feature in some of the world’s most beautiful and discerning hotels, including II Salvatino in Florence, the Capri Palace, The Capital Hotel, Knightsbridge, Cannizaro House in Wimbledon and the enchanting Bingham Hotel in Richmond. The Senti Shop located in the heart of Wimbledon Village is a beautifully calm oasis, where you will be tempted by the candles, bath and body products and home fragrances from a unique selection of brands; such as Dr Vranjes from Florence, Café Florian, Rigaud, Ester & Erik, Cochine, Timothy Dunn and Ruth Mastenbroek. Senti are delighted to announce the arrival of a new collection of luxury candles from renowned Florist Timothy Dunn this summer. 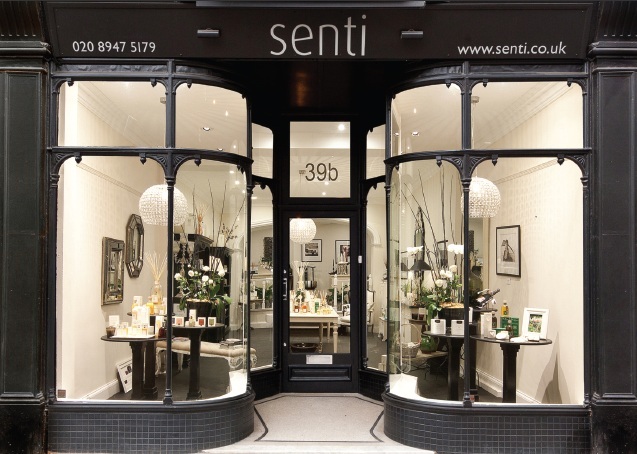 Launched to a selected group of Timothy Dunn and Senti patrons at the Senti shop in Wimbledon Village in June, the evening was a huge success. The glorious collection of candles will add a touch of luxury to your home. Each candle is inspired by his love of flowers and his travels around the world. 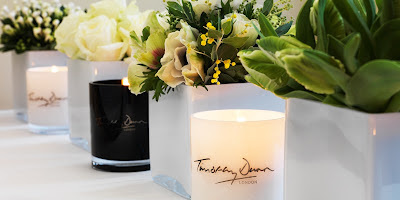 For over twenty years Timothy Dunn has been one of the leading lights of British Floristry, designing floral creations for a coterie of celebrities and renowned brands and events. Made from a unique blend of wax that has been crafted over many years to ensure a lasting fragrance and even burn, each individual scent has been artfully blended using an incredible array of luxurious fragrant oils and Timothy Dunn’s mastery of flowers and scent. Timothy has travelled the world to inspire his floral designs and discover flowers from exotic locales – from Samarkand and Istanbul to the golden souk of Dubai, from the Windward Isles and the billowing breezes of the Mediterranean to the Maldives. 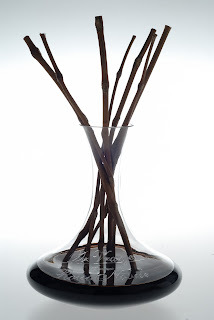 Each of his unforgettably intense candles builds upon his passion for and life-long experience of working with flowers. An intoxicant of the senses transports you to memories long since lost, and to exotic locations far away. Take a taper to one of Timothy Dunn London’s handpicked candles and be transported to new worlds. The entire Timothy Dunn collection has been manufactured and packaged in the UK. Each candle is housed within a beautiful hand blown glass container with his signature pure platinum logo printed on each candle. Beautifully packaged in distinctive cylindrical boxes with a sensuous leather-finish paper, the intense fragrances collection are housed in black and the lighter, fresher scents are housed in white. Each individual fragrance is signified by a unique strip of foiled colour on the box, distinguishing each scent as one of a kind. A fresh, floral blend of Moroccan rose, dewy violets, and sugared raspberries combined with an array of sensual musk. A refreshing, ozonic floral complex, with top notes of grapefruit, orange flower and jasmine, enhanced with notes of violet, geranium, ylang ylang and muguet. An invigorating blend of grapefruit, lemon and lime enhanced with fresh notes of cedar, sandalwood and muguet. A heady floral complex with top notes of tuberose, frangipani and jasmine enhanced with base notes of powdery heliotrope, vanilla and musk. An exotic blend of precious oriental oils, Moroccan rose, and neroli flower enhanced with sensual sandalwood, violet, fig, wild jasmine with a hint of dark, luxurious chocolate. Oud a rare precious natural oil from north-east India, has been blended with frankincense, sandalwood, and saffron, and enhanced with base notes of iris to create a scent redolent of Arabian nights, suffused with eastern promise. A delicate floral blend of orange blossom, cyclamen and lily enhanced with sophisticated notes of amber wood, vanilla and heady musk. A rich, aromatic accord of exotic tea, cardamom, bergamot, ginger and clove wrapped in nutmeg and sumptuous Madagascan vanilla. The Timothy Dunn candle collection can be found at the Senti Shop in the heart of Wimbledon Village at 39B High Street. Telephone 0208 947 5179 Web: www.senti.co.uk. Senti, the home of all things fragrant, offer a wonderful selection of scented bathroom luxuries. 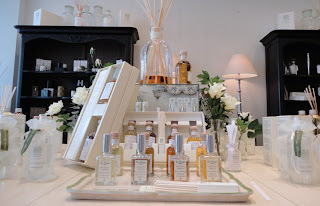 Senti are the sole distributor of Dr. Vranjes Home Fragrances, one of the finest producers of home fragrances and offer the most extensive range of his products, anywhere in the UK. 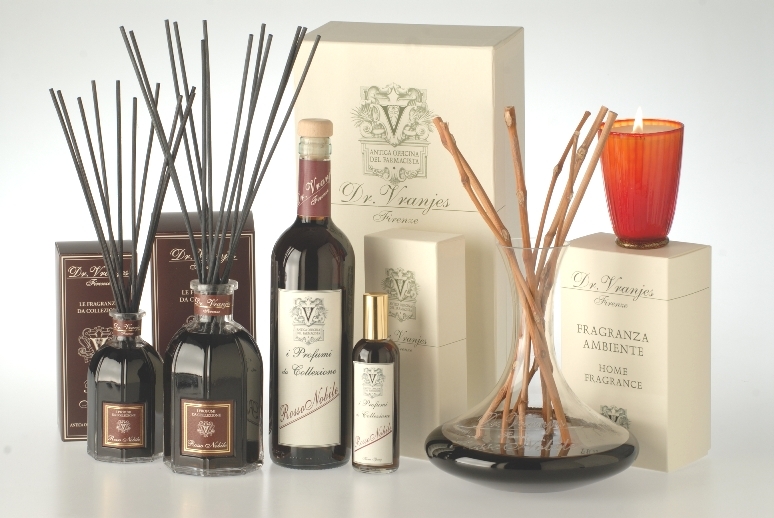 The Dr. Vranjes range includes a variety of home fragrance diffusers, bath and body products, perfumes and candles. 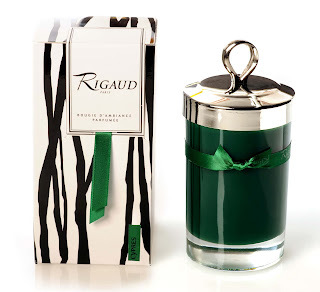 Rigaud Paris candles are the finest, most elegant and highest quality candles made in the world today. The Cyprés candle was created over 100 years ago to fill the air of Madame Rigaud's fashion boutique on the Champs Elysees in Paris. 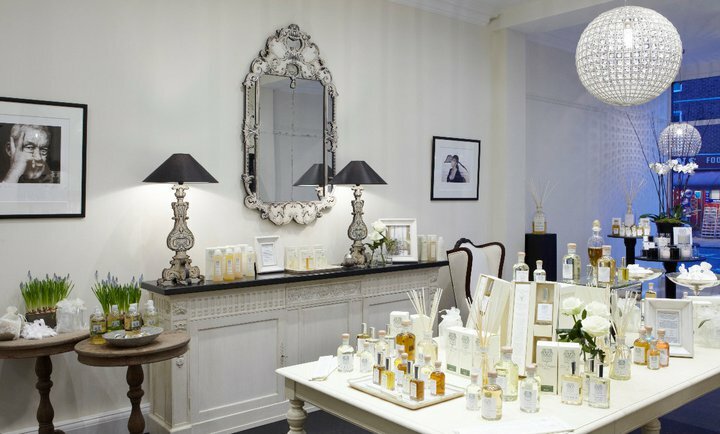 As Madame Rigaud's customers noticed the refreshing scent of the Cyprés candles they insisted on purchasing one for their homes and the Rigaud candle collection was born. The original Rigaud candle fragrance - Cyprés has the aromatic sweetness of lavender, the woody and crackling notes of pine needles and the powerful aroma of cedar wood. Perfect for this time of year is the floral fragranced, Gardénia Rigaud candle has a voluptuous, intoxicating floral bouquet, blending the scents of white flowers with the fresh, green notes of Provence rose. A timeless fragrance that envelops you in sweetness! 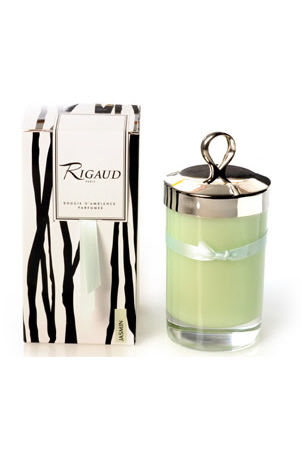 For a touch of the exotic, try the Rigaud Reine de la Nuit candle. Reine de la Nuit is a blend of freesia, mandarin, Queen of the Night, orange blossom, sandalwood, and myrrh. This exotic, elegant fragrance emits an aroma that was created from a sumptuous and mysterious flower. 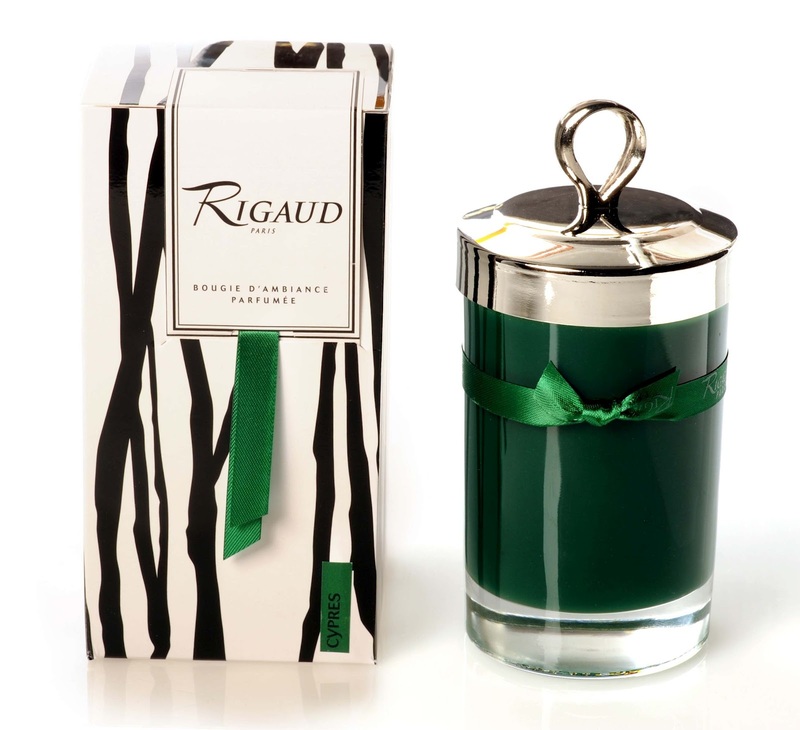 Rigaud candles are presented in a container of hand-blown glass, delicately tied with ribbon and a silver-metal snuffer cap. Prices start from £48.00. If you’d like to present your Father with a stylish gift this coming Fathers Day, something that will last and remind him of you everyday then here are some ideas from Senti. Czech & Speake's signature fragrance, No.88 is a truly English scent and perfect for a Fathers Day gift. The first and most complex in the Czech & Speake Aromatics Collection, No.88 has a fresh, woody top note of reviving and uplifting bergamot, the richness and warmth of geranium, rose otto, cassie and exotic frangipani. Combined with dry base notes of vetiver and sandalwood, this modern classic has a full-bodied, sophisticated sensuality. Prices start from £75.00. 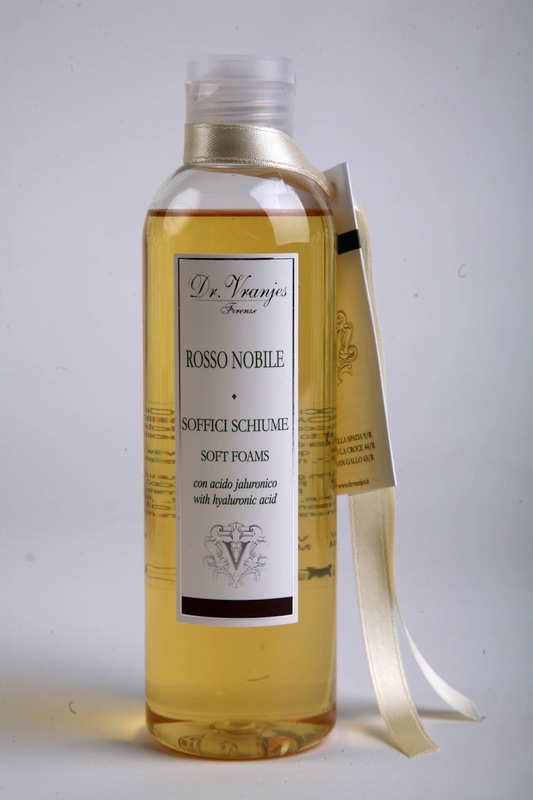 Created and lovingly made in Florence by Dr Paolo Vranjes - a chemist, cosmetologist and perfumer, Rosso Nobile is a very special room fragrance that will delicately scent an office, study, den or even his potting shed! Based on a desert red wine infused with herbs and spices this fragrance is presented in two handmade boxes and displayed in a handsome decanter (£169 750ml with decanter). This unique fragrance is delicately diffused by vines which will welcome any visitor and delight any lucky Father lucky enough to be given one. Rosso Nobile is also available in 250ml beautiful glass bottles with black reeds (£69.00), inspired by and carefully created to follow the lines of the famous ‘Duomo’, Florence’s Cathedral of Santa Maria di Flori. 500ml refills are available at £70.00. For more information on Rosso Nobile click here. With Father's Day coming soon, fathers everywhere will be eagerly anticipating a day of pampering, relaxation and of course to see what wonderful gifts they will receive from their offspring. For Fathers who are difficult to buy for and who have excellent taste you won’t go wrong with a Cyprés scented candle by Rigaud from Senti. This stylish gift will last long after Fathers Day is over – the elegant and masculine scented Cyprés candle from Senti will add a traditional ambiance to any home. Rigaud candles are the finest, most elegant and highest quality candles made in the world today. The Cyprés candle was created over 100 years ago to fill the air of Madame Rigaud's fashion boutique on the Champs Elysees in Paris. As Madame Rigaud's customers noticed the refreshing scent of the Cyprés candles they insisted on purchasing one for their homes and the Rigaud candle collection was born. The original Rigaud candle fragrance - the aromatic sweetness of lavender, the woody and crackling notes of pine needles and the powerful aroma of cedar wood all intermingle. The dark, masculine colour of the Cyprés candle is presented in a container of hand-blown glass, delicately tied with a green ribbon with a silver-metal snuffer cap.